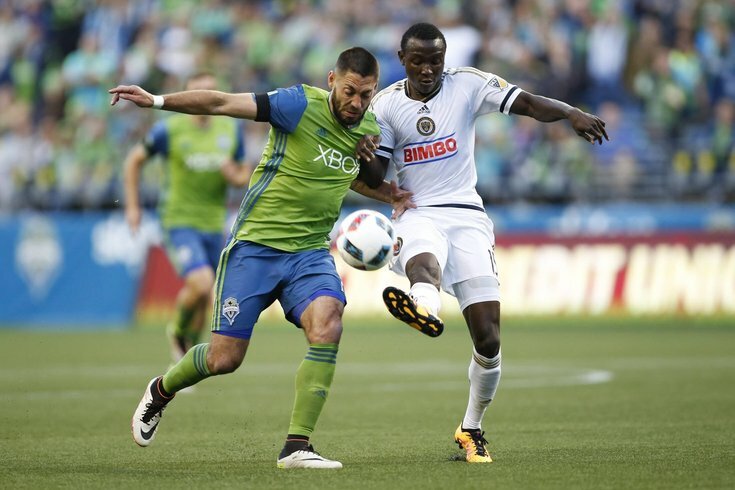 Josh Yaro battles with Clint Dempsey during the Union's 2-1 loss on Saturday night. For the second time in three weeks, an avoidable red card cost the Philadelphia Union a good chance to bag some road points. Jim Curtin's team started well on Saturday night, then shot itself in the foot en route to a 2-1 loss. It's a disappointing result, considering the fact that the Union left for Seattle on Thursday morning, prepared well for the game, and did not look outmatched (even when it was 10 versus 11). The Union generated 13 shots, but only put three on frame. They out-possessed Seattle over the course of 90 minutes. Philly earned more restart opportunities and won the bulk of challenges and duels. They just couldn't turn those numbers into anything impactful on the score sheet. Curtin made a couple of personnel changes in this game. With Ken Tribbett and Ilsinho unavailable through injury, he used Josh Yaro at right center back and handed Sebastien Le Toux another start at right wing. 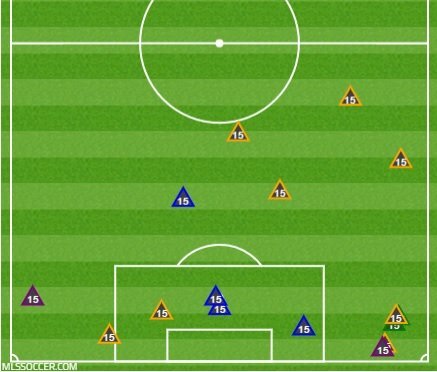 Most notable, perhaps, was the decision to play Warren Creavalle at the 6 spot in place of Brian Carroll. It's something that's been discussed in recent weeks; can Creavalle handle a more "conservative" role in the Union midfield? For the most part, Creavalle did well in this game. He doesn't have the veteran savvy that Carroll possesses, but he can cover more space and use his athleticism to put out fires and recover from positions that a 34-year-old veteran might have trouble with. Take a look at the heatmap comparing each team's holding midfielder. Ozzie Alonso is on the left and Warren Creavalle is on the right. Creavalle's main position is that sweet spot right in front of the Union backline. He did get a bit further forward than Alonso, though Seattle's #6 was on the ball a bit more. That's not unexpected, considering the fact that Vincent Nogueira is usually the deep-lying starting point for Union build-up play. The axis obviously tilted after the red card as well. Creavalle went 46 for 53 in passing (87%). He put in seven successful tackles and added one block, five interceptions, and eight clearances. One-week after a brutal performance for Bethlehem Steel, rookie Josh Yaro earned the first start of his MLS career. Why was he preferred over Anderson? For starters, Anderson is left footed, and Yaro is right footed. They could have certainly played Anderson at LCB and moved Richie Marquez to RCB, but that would essentially switch two positions, instead of one. The coaching staff seems to like Marquez on Fabinho's side. In this case, starting Yaro provided a right-footed option next to (former teammate) Keegan Rosenberry on the right side of the field. For the most part, Yaro was fine. He had a couple of hairy moments in the game, but it was Marquez who had more responsibility on the Seattle goals. Yaro won two tackles and added four interceptions, two clearances, and recoveries. The key for me is those three blue triangles inside the box. Those are three interceptions in a crucial spot. In one case, there was a touch that came off his shin, but instead of leaving the ball for Andre Blake, he made the smart decision to just get there first and clear out of the box. That's the kind of no nonsense stuff that you like to see from a rookie. If a situation gets tricky, just keep it simple. It wasn't always fluid for Yaro, but he handled mostly everything that came his way. He had an early look, but hit a shot over the bar with his weaker left foot. Later, there was a nice bit of hold-up play that almost put Pontius in on goal, but Seattle had the square ball covered. On the Le Toux goal, his knockout was perfectly placed. He was better this week, and took his goal well. It was Seba's 50th all-time Union goal. Before the red card, he really wasn't having a bad game. Alberg didn't have a ton of touches in the first half, but he showed some nice ideas in combination play and seemed to have a little bit of a better understanding with his teammates. The ejection wasn't dissimilar to Creavalle's red card in Chicago. The second challenge just didn't need to be made, and Alberg earned the yellow because his trailing leg basically turned a stretch tackle into a scissor. It's been more than a month since his brace in Columbus. Nogueira was the man of the match and had at least three brilliant passes that I counted. Two balls he hit with the outside of his boot to put Pontius into dangerous positions. Another was a combination Marseille turn and layoff that put the ball into the right channel for a cross. Nogueira played with an outward emotion in this game that I haven’t really seen before. Even while down a man, he was driving the play and spraying balls all over the field. The one knock I'd place on him is that he did a bit of ball watching on the Ivanschitz shot that Blake tipped over the bar. He made a really nice play around the 15th minute, when Seattle sprung a counterattack but he held position at the edge of the box to dispossess Osvaldo Alonso. Things got a bit dicey in the middle part of the game, when Seattle was able to identify some soft spots and spring more numbers forward. Once the red card came out, there were obviously some stretched moments where Creavalle was working box-to-box as Philly tried to find an equalizer. He took a tactical yellow in the first half, which is par for the course from Fabi. Before halftime, he did very well to stay disciplined on a Seattle counterattack, and ended up snuffing out the play with a blocked cross that struck his arm from about two feet away. The Sounders wanted a handball, but you're never going to get that call. Otherwise, it was a rather routine game for the left back, who picked up a rather innocuous secondary assist on Le Toux's goal. It wasn't Marquez's best game in a Union shirt. On the first goal, he's impeded by Clint Dempsey on a set piece pick play. It's probably a foul, but it's the same kind of play that Kei Kamara scored from in the Columbus game. Marquez might just have to dirty it up a little bit more on those set plays, because he's not going to get those calls from the ref. With the Jordan Morris goal, it's a great ball behind the defense. Marquez looks to be in position, then ends up on the inside shoulder as Andre Blake backpedals. It's a smart finish from Morris, but I think both Union players could have played it a bit better. About 15 minutes in, he lost out on a shoulder-to-shoulder with Jordan Morris inside the box, but Blake was there to make the save. Ten minutes later, he made a smart read to get on the end of a quick throw-in and beat Dempsey to the ball. I watched the replay of the game and didn't see a lot of mistakes from Yaro. He certainly wasn't directly culpable for either Seattle goal. There's a reason the Union traded up to draft him at #2 overall. Rosenberry looked good early and fired in a couple of crosses, plus a little turn around layoff that put C.J. Sapong in a scoring position from 16 yards out. He played a tough, field-switching pass for Marquez in the 15th minute that ended with a turnover and a Seattle scoring chance. Overall, it was much of the same. You saw some good attacking moments combined with a couple of iffy defensive moments and pass choices from Rosenberry. It's hard to be critical of Blake, who has basically denied a surefire goal in every game this season. His angle seemed to be a bit off on the game-winning goal, but it wasn't the easiest play to read. @KevinKCBS3 after he stepped forward for the initial through ball, he didn't correct his angle. But we're being really critical. Similar to the Chicago game, there's not much you can do when you enter a 10v11 game. Barnetta had a couple of restart opportunities in the second half, but couldn't replicate last week's moment of brilliance. He should start for the suspended Alberg next week. Still looking for his first MLS goal, he played up top again, with Sapong moving to a wide right position. The first yellow for Alberg felt like it was more for persistent infringement, instead of the nature of the tackle itself. The second yellow was hard to argue. Otherwise, Fischer was a bit inconsistent, especially in the second half when the game started to become more chippy with the Union pushing for an equalizer.